Day 1: Marrakech - High Atlas – Ait Ben Haddou - Ouarzazate - Dades Canyons. At 09:00 a.m , you get the departure from Marrakech crossing the magnificent sightseeings and landscapes of The Highest Atlas via the Tichka Col (2260m) to "Telouate Kasbah" , which was Pacha El Glaoui's ex-hostel. Such Kasbah reflects the feudal era in Morocco. 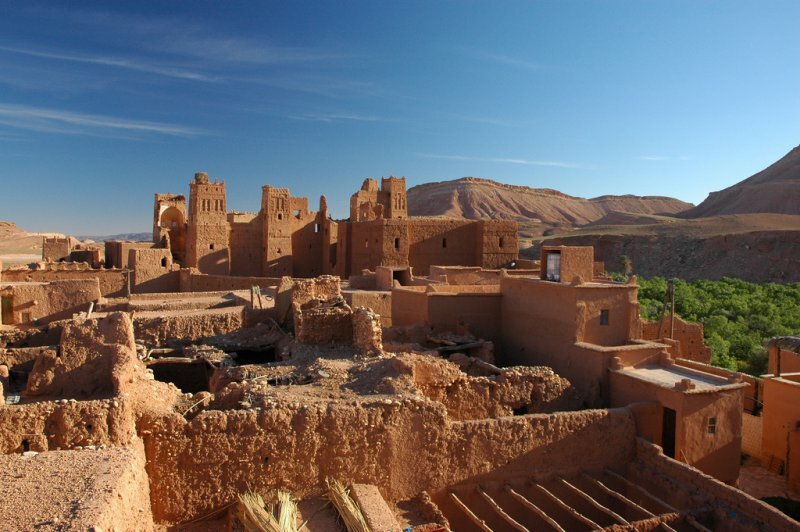 After that, we take Ounila valley's road ,which used to be caravans alley , down to Ait Ben Haddou Kasbah which is classified as an international patrimony of humanity by the UNESCO. 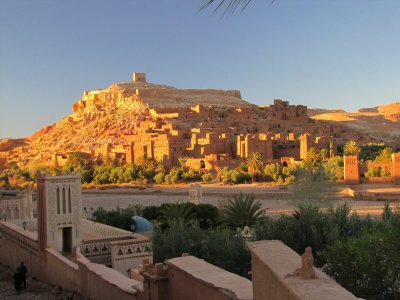 Ait Ben Haddou Kasbah was also a location to many international films like "Nile Diamond", "Alexander the Great", "Lawrence of Arabia" .After having lunch , we carry on the journey to Ouarzazate to have lunch at a restaurant which offers a panoramic view of Taourirt Kasbah. 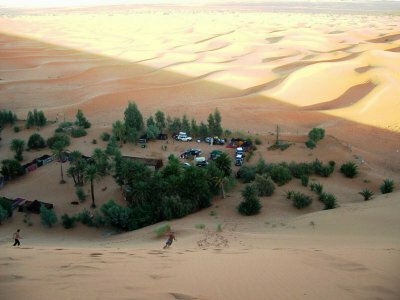 Next , we get on the road again to Skoura Oasis to make a visit to "Amerdile Kasbah " . The Thousand Kasbahs' road is taken as soon as we leave Skoura heading for El Kelaâ M'Gouna .Then, we ,altogether, make an excursion to the flowers valley after visiting a nomadic Amazigh family living in caves. You will appreciate the charming canyons and the series of Ksours and kasbahs through out the road. The night is spent at «Xaluca Dades" hotel in Dades Canyons. Day 2: Dades Canyons – Boumalne – Tinghir - Todra Canyons – Alnif - Merzouga. After taking breakfast, you get the departure to Alnif crossing a mountainous alley to Jbel Saghro and Jbel Ougnat. Alnif is trilobite Capital. You can cease the opportunity to hire a guide to look for trilobite . You have lunch there .Then, we head for Rissani, the Alouite Dynasty's hometown , which used to be the Commercial capital of Morocco in the middle age and used to be called Sijiilmassa . Sijilmassa 's commercial Caravans used to take alley to Niger and Mali .We keep on the journey to Merzouga passing by Erfoud, known for its fossil marbles’ workshops. After arriving at Merzouga dunes (Erg Chebbi) , you can ride camels for 1 h and 30 m to witness the charming Sahara sunset and spend a night in a luxurious Amazigh bivouac after having dinner. Day 3: Merzouga - Taouz-Ramlia - Mharech Oasis - Tafraout - Zagora. This journey is of the great desert spaces. At 8:00 a.m ,we go back to the place on camels to the hostel .After having a shower and breakfast , we head for Taouz to see ancient engraved drawings .We stop at Gnaoua village to drink tea and enjoy the local African music. Then, we get on Paris-Dakar road to visit the isolated Ouzina and Ramilia Oasis crossing the sandy zones to arrive at M'harech Oasis. Next, we pass through "Chot Maider" and "Dinosors Valley' to Agoult just after having lunch. We also cross "Zguilma" and Tagounit in order to arrive at Zagora where you spend a night at "Riad Lamane " or "Les Jardins de Draa". Day 4: Zagora – Tamgrout - Draa Valley - Agdez. You get a free morning to relax or even to have a walk through the palm groves. In the afternoon, you get on 4x4 to enjoy the local beautiful scenes such Kasbahs, palm groves and fields of "Hanna" .The journey ends up with visiting Tamnaugalt Kasbah and ,then, you spend a night "Chez Yacoub". Day 5: Agdez - Ouarzazate-Marrakesh. After taking breakfast, we cross the Anti-Atlas to visit Tizgui Waterfalls. 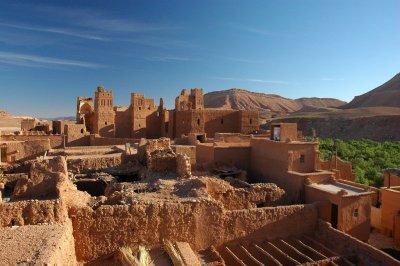 Then, we head for Ouarzazate to visit cinema studio and Taourirt Kasbah.At the end, we pass through Tichka col to arrive at Marrakesh in the late evening.